In a bowl mix walnuts with a little melted butter and some honey until coated. Arrange on a baking tray and bake in a medium oven for 5-8 minutes or until caramelised. 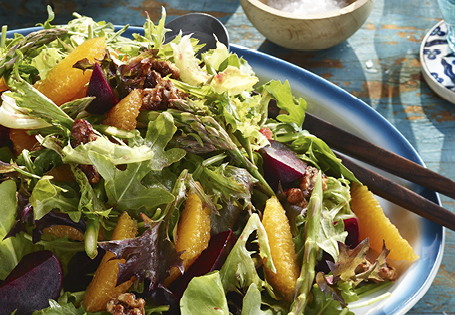 Meanwhile, toss mixed leaves with beetroot quarters and orange segments. Scatter over candied walnuts and dress as desired. Beetroot – cooked, cooled and quartered.